Do you or a friend suffer from mobility problems? Would you like to visit places of interest? But due to lack of organised accessible transport, are unable to do so. There is no need to worry about travelling to a designated pick up point, we will call for you, and return you to your home. The mini-bus is fitted with a tail-lift, making it fully accessible. To use our services you must be a member. Membership is £10 per year. Excursions are costed individually. Gilesgate, Belmont, Newton Hall, Brandon, EshWinning, Bearpark, Langley Park and Durham plus surrounding villages. Bowburn, Kelloe, Newton Hall, Framwellgate Moor, Durham plus surrounding villages. Live Outside The Durham Area? 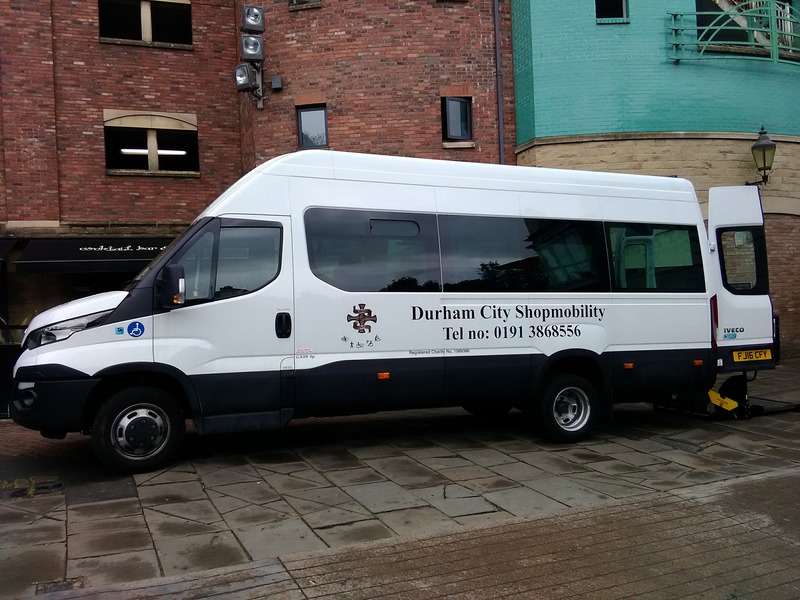 Whilst the attraction of door to door service would be lost for members residing in areas other than listed, they can still make use of the mini-bus excursions - providing they can make their own way to and from a central Durham City pick up point. MOBILITY EQUIPMENT: If you require mobility equipment at the venue, the cost of hire is between yourself and the mobility supplier. Where indicated sufficient mobility equipment is available for hire at the venue. However some of the listed venues do not supply mobility equipment and in this instance, we will transport a limited supply of our own equipment. It is therefore, in such instances, vital that members who normally require equipment book as early as possible. Members are also respectfully reminded that all Excursions must be paid for no later than 14 days prior to the Excursion taking place. Please note if you cancel within 14 days prior to the excursion date, we will be unable to refund the payment unless we can allocate the seat to someone else. However if for any reason we find it necessary to cancel the trip, we will automatically refund your payment.